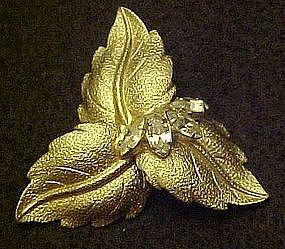 Pretty gold tone leaf pin with rhinestone accent stones near the center. Pin measures 2" wide. Nice tight back and safety closure. Excellent condition. Unmarked. 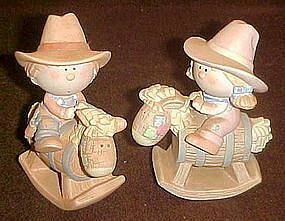 Adorable little pair of Bumpkins figures by George Good. This is the cowboy and cowgirl riding their hobby horse's. Made of bisque porcelain and measure 5 1/4" tall. Excellent condition but no boxes. 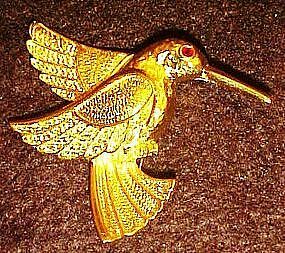 Pretty gold tone metal pin is a hummingbird. Nice detailing with a ruby rhinestone eye. Nicely made and has a good tight back and asafety closure. Like new. Measures 1 1/2" x 2". Great gift for the lady who loves bird items. This is a really neat pin and measures 3 1/2" long and is silvertone in color. Excellent condition. Nice tight pin back and safety closure. 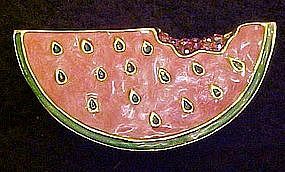 This amazingly yummy pin is gold tone, and is three-d shape of a watermelon slice (not just flat). 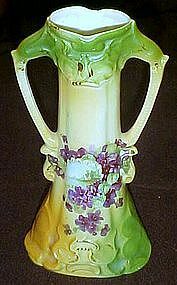 Decorated with enamel colors and tiny little aurora pink rhinestones where the bite is. Measures 2" long. Nice tight back and safety closure. Like new, no name on the back. Nicely made. Here is one figurine, of the pair of Ceramic Arts Studio chinese chinese couple Wing-Sang, playing a hand held gong, and a bamboo vase on which he stands by. These pieces were copyrighted in 1947. He is 7" tall, and the bamboo vase is almost 6" tall. Excellent condition, free of chips, cracks or repairs. We don't have the matching Lu-Tang but maybe you do! This is refered to as the young girl in the book of Florence ceramics. She measures 6 3/4" tall and is in perfect condition. She has an opening for flowers. Florence figures have such sweet faces, and she is no exception. A rather unusual piece of ceramic arts studio.Maybe a rare piece! 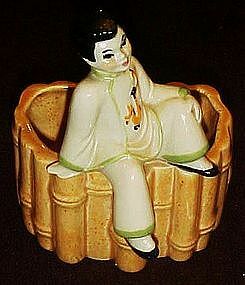 This boy is refered to as the chinese sitting boy (he is pictured as a shelf sitter) in the book, but this one was made with a large size bamboo planter attached. Marked with the factory stamp. Measures 5 1/4" tall and is in perfec condition. Though Ceramic Arts Studios made lots of these chinese bud vases, the white is a rare color to find. We do not have the boy Wing-Sang in the white robes. Marked on the bottom with their studio mark. Measures 6 5/8" tall. Perfect condition. Adorable vintage wall pocket with a blessing for you and your guests. 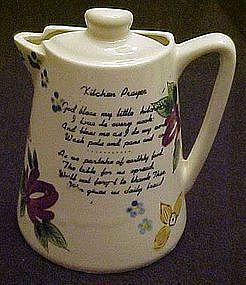 Shaped like a coffee pot and is hand painted uderglaze with colorful vintage flowers. Kitchen prayer in the center. Measures 6 1/4" tall and is in excellent condition with no damages. Lovely old vase is stamped in a circle GERMANY and a mold # 2340 into the porcalin underglaze. Soft colors of green and yellows and decorated with lots of violets If you look closely you willl see the violets border a small house and lake scene. Measures 8" tall and there are no chips or cracks. Well 100+ years old. Nice set of coaters if you have a lab in your life. 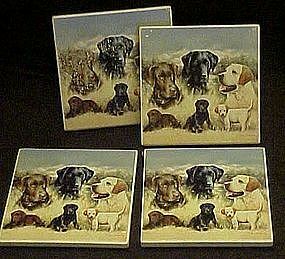 These picture the golden retriever, black lab, & chocolate lab, adult and puppies.Made of a slate type ceramic with cork backs. Measures 3 5/8" square. and is 1/4" thick. All are in good condition except one is a little messed up on the picture area. (you can see this in photo). Someone had tape on that area. Otherwise all others are excellent. Cute nodder made of a plastic composite. Dated 2002. This little Campbell kid chef measures 6 3/4" tall and is in perfect condition. Head is on a spring mechanism. I have 2 available. Price is for each. 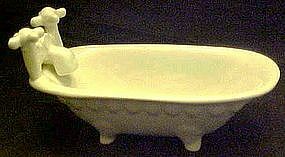 Nice large size ceramic tub will hold all of your pretty soaps. Made of white glazed porcelain. measures 2 1/4" tall plus faucets and is 7 1/2" long. Pristine condition with no damages! 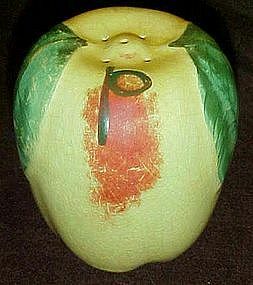 Here is a very old apple shaker made by Hull pottery. Measures 3 1/2" tall and is hand painted. P for pepper.Crazing all over, no stopper. If you have the matching salt, this is your lucky day! No chips or cracks. 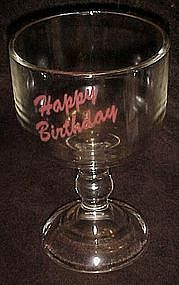 A great gift for that birthday guy! Chill it, and fill it with his favorite brew and you have made his day! Made of heavy glass and measures 8" tall. Perfect condition. 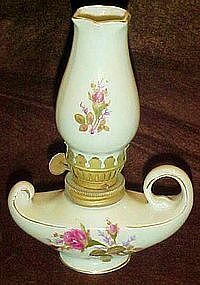 Adorable and all original little ceramic lamp with the moss rose pattern. Shade pattern matches lamp pattern. Sticker is off the bottom but this was probably made in Japan. Measures 5 7/8" tall. Perfect condition with no damages. 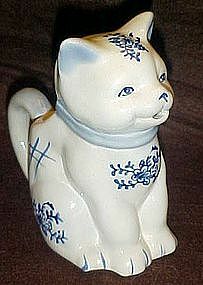 Adorable little cream pitcher for the cat lover. White with delft look decorations of dark cobalt blue. Measures 4 7/8" tall and is in perfect condition. No sticker or makers mark. Nice heavy porcelain.